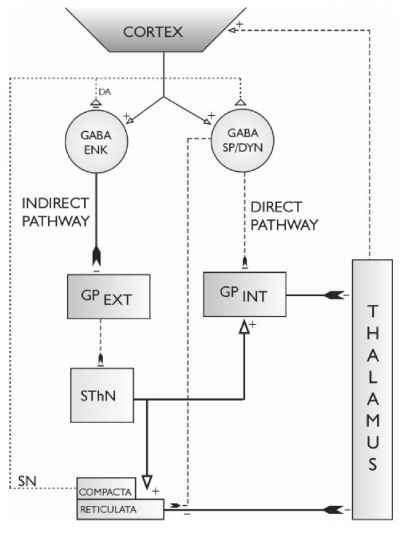 Figure 15.2(a) A schematic presentation of possible normal basal ganglia circuitry. Activity in the corticothalamic pathway is modulated by striatal control of the globus pallidus (pallidum) through two pathways, the indirect pathway (Ind Path) to the external pallidum/globus pallidus (GPext) and the subthalamic nucleus (SThN) and the direct pathway (Dir Path) to GPint. Scheme based on that of Chesselet and Delfs (1996) but see text. 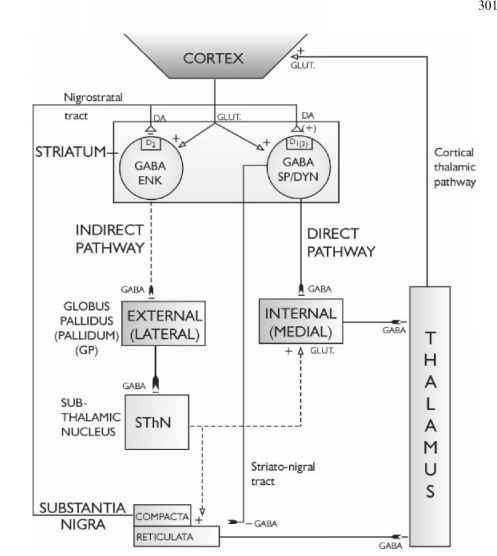 Pathway activity: — low; — normal; — high it from the cortex and thalamus is processed and channelled to the pallidum (globus pallidus, GP) and to the substantia nigra reticulata. There are two main output pathways from the striatum to the globus pallidus. (1) The direct pathway (Dir Path) which makes monosynaptic contact with the internal (medial) globus pallidus (GPint) and to a lesser extent the substantia nigra reticulata (SNr). (2) The indirect pathway (Ind Path) which also influences GPint and SN but only after going through the external (lateral) GPext and the subthalamic nucleus (SThN). The GPint and, to a lesser extent, the SNr modulate activity through the thalamocortical motor pathways (Fig. 15.2a). These outputs and both the direct and indirect pathways appear to be inhibitory. The axons of both pathways arise from the medium spiny neurons that constitute 80% of striatal cells. These neurons release GABA but those to the Ind Path have metenkephalin as a co-transmitter and express only D2 receptors while those to the Dir Path have dynorphin and substance P (the latter mainly to SNr) and express both DA receptors but D1 predominates. Activation of D2 receptors results in inhibition of the GABA/ENK neurons of the Ind Path, and probably of the Dir Path, but the D1 effect could be excitatory on the neurons of the Dir Path as there is a reduction in substance P mRNA in the striatum after blocking its DA input. Normally (Fig. 15.2(a)) DA inhibits the Ind Path to GPext so that this is then free to inhibit the SThN. This latter system can then no longer drive, through glutamate release, the SNr or GPint whose inhibitory outputs are reduced. The assumption is that the thalamo-cortical pathway can then function properly and movement is normal. The role of the Dir Path is less clear. When it is active it should inhibit Gpint (and SNr) and so reduce their suppression of the thalamo-cortical pathway. If it is inhibited by DA in the striatum then the converse applies, GPint will be active and thalamo-cortical traffic will be reduced. On balance it seems, however, that DA stimulates the neurons of the Dir Path so that the GPint is inhibited and thalamo-cortical flow facilitated. Some evidence for this comes from the finding that in Huntington's Chorea when the GABA/ENK (Ind Path) neurons degenerate and the Dir Path dominates the patient suffers from dyskinesias-facilitated movement. 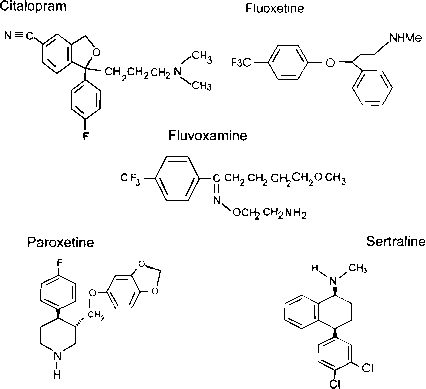 Whatever the precise activity of these pathways, DA obviously has a pivotal role in their control. Thus in PD (Fig. 15.2(b)) when there is little DA to inhibit the Ind Path there is more inhibition of GPext which frees the SThN to drive GPint and SNr to inhibit the thalamo-cortical link and motor activity, i.e. produce hypokinesia. The fact that lesion of GPext causes some rigidity in animals supports this. Also if the Dir Path is not driven in the absence of DA, this will also free GPint to inhibit motor activity. So how can the abnormal pattern of striatal activity that causes akinesia be restored to normal?